Ian Beer, one of the well-known iOS hackers in the jailbreak community who helped in development of Electra jailbreak tool for iOS 11.x.x. It looks like that Beer is not slowing down a bit as he just announced on Twitter that he’d be releasing some new iOS 11.4.1-centric exploits. Beer didn’t divulge much about his iOS 11.4.1-centric exploits in the Tweets, leaving tons of wiggle room for interpretation. As of this writing, there’s no telling what the exploits might encompass and whether they’ll contribute to another jailbreak tool before prominent hackers begin pecking away at iOS 12 in search of vulnerabilities. Speaking of iOS 12, this appears to be Beer’s new point of interest. 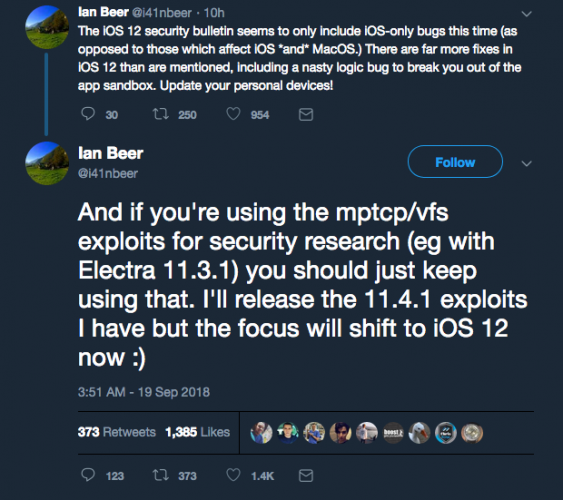 After releasing his iOS 11.4.1 exploits, Beer will prioritize iOS 12 exploitation efforts, leaving his previous work in the hands of the jailbreak community. From then on, it would be up to the talented jailbreak teams such as the Electra Team to make magic happen. Despite the challenges ahead, this hasn’t stopped hackers from finding ways around Apple’s latest security measures. Just one day after iOS 12’s launch, researchers with Ali Security demoed a fully-untethered jailbreak for it. While the tool’s release is unlikely, it proves that no piece of software is hack-proof. It would be a great thing to see further progress within iOS 12 jailbreak, what do you think ?